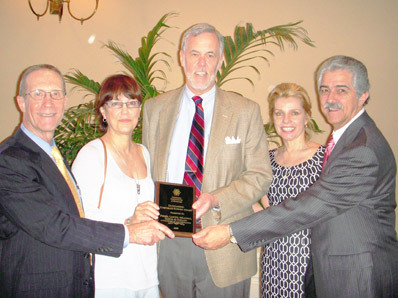 On May 18, 2009 the Louisiana Association of Museums presented the "Outstanding Corporate Support Award" to the Acadiana law firm of Perrin, Landry, deLaunay, Dartez & Ouellet. The law firm was nominated by Kermit Bouillion. In 1989, the corporation expended $25,000 to renovate the old abandoned Bank of Erath building, one of the oldest buildings in the town of Erath. During the last twenty years, the corporation has allowed the museum to operate out of the building, at no cost, with the corporation also paying all of the overhead costs. The museum has been an important part of maintaining the Acadian culture and heritage throughout the Prairie Bayou region between the Techs and Vermilion Bayous of Vermilion and Iberia Parishes. Vermilion Parish has the largest percentage of French speakers than any other county/parish in the United States. The museum staff consists of 75 bi-lingual volunteers. Exhibits are in French and English. Because of the nominee’s support, the extensive collection of materials on Acadian history and genealogy are open to the public without charge. The museum has on display over 3,000 artifacts. It is the only Louisiana museum which displays artifacts from pre-deportation Nova Scotia. It also has an extensive exhibit on "Evangeline" materials, including the first artistic rendering of the icon’s image painted on porcelain in mid-19th century. Erath was inundated by floodwaters of both Hurricanes Rita and Ike. Sadly, due to Rita, it is estimated that the museum lost 500 artifacts/objects. Of the items damaged, it is estimated they comprise the following categories: homespun textiles - 20%; family files (photographs, letters, diaries) - 20%; Acadian photographs - 20%; tools - 5%; cloth-based objects (nail sacks, Mardi Gras costumes, dresses, etc) - 10 %; Acadian history books - 20%; historical maps - 5%. Nominee underwrote all expenses incurred by the museum in the remolding and restoration from the storms damages. Due to Ike in ’08, the museum had to suspend their popular "Living Legends" program (recognizes people who promote the Cajun/French culture), but due to the generosity of the corporation underwriting the costs, the monthly program will re-commence on March 28th. Without the 20 years of substantial financial support by the nominee, the museum would not have ever opened and progressed to where it is now the anchor of cultural tourism in Vermilion Parish. Shown in the photo are: (L to R): Warren A. Perrin, Mary B. Perrin, Ford W. Bell, Rebecca Landry and Donald D. Landry.